Martin Luther King, Jr. Day in 2019 will be observed on Monday, January 21. The day is an official national holiday observed across the country, with most federal, state and local government offices closed for the day. Some private businesses close as well at their own discretion. The holiday occurs on the third Monday in January as an observation of the civil rights leader's birthday, which was on January 15. The law setting the holiday was signed by President Ronald Reagan in 1983. Concurrent with this holiday is the Martin Luther King, Jr. Day of Service. On this day, citizens are encouraged to engage in volunteer volunteer service in honor of Dr. King. The federal legislation was signed into law by President Bill Clinton in 1994. In Reno, there are numerous opportunities for volunteer service. You can see if something is of interest in the Reno listings of volunteer organization All for Good. You can also conduct your own search to see if there is something in your neighborhood. 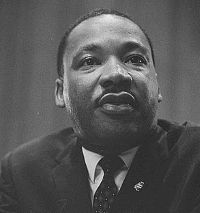 This annual Martin Luther King, Jr. Community Interfaith Memorial Service at the Unitarian Universalist Fellowship of Northern Nevada, on Sunday, January 20, 2019, at 3 p.m., is open to the public. It is presented by the Northern Nevada Martin Luther King, Jr. Holiday Committee and the Nevada Clergy Association. The Unitarian Universalist Fellowship is at 780 Del Monte Lane in Reno. For more information, call (775) 851-7100. The annual memorial caravan along U.S. 395 / I580, in honor of naming the route after Martin Luther King, Jr., will be on Monday, January 21, 2019. Meet at the Second Baptist Church at 10:30 a.m. The address is 1265 Montello Street in Reno. This celebration dinner will be at the Atlantis Resort and Casino and is open to the public. It will be on on Monday, January 21, 2019, hosted by the Northern Nevada Black Cultural Awareness Society (NNBCAS). A silent auction starts at 5 p.m., dinner and program begin at 6 p.m. The guest speakers will be Michelle Saahene and Melissa DePino, co-founders of From Privilege to Progress. Individual tickets are $70. Other sponsorships are available. Tickets can be purchased online. For more information, call (775)329-8990. Monday, January 21, 2019. As part of the National MLK Day of Service, Truckee Meadows Parks Foundation (TMPF) will be hosting a bioblitz in Martin Luther King Jr. Memorial Park from 9 a.m. to 12 noon. The Day of Service Bioblitz is free and open to volunteers of all ages. Martin Luther King Jr. Memorial Park is located at 305 Coretta Way and Kennedy Drive in Reno. (775) 453-0566. Admission fees will be waived at many public lands facilities administered by the federal government on Martin Luther King, Jr. Day. Other fees, such as for overnight camping and cabin rentals, will still apply. Facilities involved include those administered by the National Park Service, Bureau of Land Management (BLM), U.S. Forest Service (USFS) and U.S. Fish and Wildlife Service (USFWS).